I wish I could say this beautiful sunset photo was today in the Bella Coola Valley, but alas neither is it today, nor will we ever see a sunset like that in Bella Coola! We just don't get good sunsets here -- apparently something to do with the 5-7000' mountains in the way. I thought it was a good photo to end the year with because it was taken while we were travelling this year in another beautiful place in our country on a different coast. It's a good sign of how the year has ended for us, a lot better than last year and quite peaceful. Tonight is quiet in the house as the kids have returned to their various towns that they go to school in and we are all thinking about the holiday time we enjoyed together. Over the holidays my daughter and I went for an exploratory stroll on the Bella Coola River estuary, which is one of the top estuaries on the coast for overall importance of fish, wildlife, waterfowl and people. It's a nice place to go in the winter when you are tired of the frozen snow covered ground further up the valley. There were numerous ducks and the normal Trumpeter Swans enjoying the ice free conditions and food abundance that they can access in the marshy areas. It's wintery looking for an estuary in terms of lots of rotting vegetation and not much greenery, but still a nice break. From our home in the beautiful Bella Coola Valley of British Columbia to wherever your home is at we hope you had a very nice day with friends and family. There are many many beautiful places in our country and in places you might be traveling to so I hope you had a chance to take time out and enjoy it today wherever you happened to be. Today was a perfect wood cutting day, with conditions that we would normally experience in later winter which make it perfect for wood cutting; frozen snow crust, just below zero and no wind. The hard snow crust makes it very easy to get around in the woods and so that's what my son and I did today, got about half a year's supply of firewood cut. We were in 'salvage' firewood mode, as I had several birch and alder trees fall during the heavy rains, wind and snows we have had during the fall, so they make ideal candidates to recycle into the wood pile. It's hard work, but the 'boy' is stronger than me now, so I put him to good use hefting the big Stihl chainsaw and throwing the blocks of wood closer to where we can haul them home. Tomorrow we'll build a little appetite for that big Christmas turkey when we start splitting it - actually I'll do the piling for hauling in the spring as once my son attacks the wood with the big splitting maul it's quite a sight to see. It's kind of a like a Whirling Dervish with a splitting maul in his hands gone mad. I just duck and dodge while standing up blocks to keep ahead of him. He doesn't seem to be able to stop until every last round of wood has been quartered and fallen under the mighty blows from the maul. It's gratifying to watch. I'm sure I once could have done the same. The second day of winter dawned at anywhere between - 6 C and -13 C, depending where you live in the Bella Coola Valley. Fortunately the east wind has been relatively benign, thus making it somewhat pleasant to get out and enjoy the clear day. Tonight, it's in the -6 or -8 C range and more cold is forecast. Lots of animal tracks in the fresh skiff of snow we got on Sunday - the snowpack is hard enough in the areas of the valley with a measurable snowpack (mostly east of Snootli Creek), that even the deer can walk on the top. Wolf, Fox and Marten tracks were all abundant during a sortie around the woods today. It just didn't feel right putting up a wintery picture for today when we have already had 6 weeks of winter weather in the Bella Coola Valley! This is a shot from last summer of the plant known as Devil's Club (Oplopanax horridus), the horridus part of the Latin name meaning 'frightful and rough'. It's a challenging plant in terms of the spines on the stems and leaves which easily stick you when grabbed and leave a nice little festering spot for a few days. 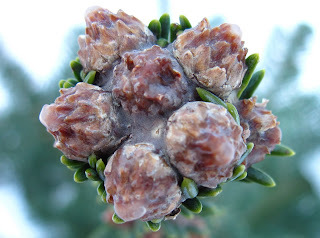 It's also an important plant for First Nations cultural and medicinal uses and wildlife (Grizzlies love the fresh buds in the spring and the berries in late summer). Luckily it grows in extensive patches in many of the valleys of the Central Coast. I've included it today to cheer you up and remind you of green times ahead. That's the kind of day we had today. Late last night a fine snow started and was still going this morning. It didn't accumulate much in the lower valley, but added 5-10 cm up in the upper valley in Tweedsmuir Park. No, I am not 'fraziled' by the weather, but thought I would look at the phenomena of "frazil ice" which is evident in any of the steep, bouldery and fast moving side streams in the Bella Coola Valley where you can now see the formation of frazil ice after a number of cold days. Streams such as the Nookliklonnik, Snootli, Thorsen, Young Creek and others are all showing a large amount of frazil right now. Ideal conditions for forming frazil are steep and bouldery streams where water is mixed and exposed to super cold air that results in ice crystals forming in suspension in the water. These 'frazils' of ice are carried along and because they are small can attach themselves to the bottom and start forming 'anchor ice' which contrary to what you would expect, causes the stream to freeze from the bottom up. Other frazils drift on down stream forming the pans of ice you see in the slower sections. With prolonged cold the stream can become all ice covered and slowly overflow, carrying more frazil around. Extended periods of frazil are hard on fish spawn because of the extensive bottom ice that can form and fish can be affected by the ice crystals in the water. Fortunately our cold spells don't tend to last all winter. In areas that they do, frazil can lead to trouble as water slowly flows and builds up ice and then water spills out somewhere where you least expect it. -17 C is a nice winter temperature for a coastal valley with a little wind attached to it. That was the temperature in my neck of the woods this morning and tonight it is a little windier but warmed up to -11 C. It's a good cold spell across the west though, certainly will be a check in Alberta and Saskatchewan for the spread of the Mountain Pine Beetle. The -40 C at Puntzi Mountain (west of Williams Lake, BC) and the Edmonton temperatures in the mid -40's are not not what those beetles like. Cold and clear continues for us in the Bella Coola Valley as it does for most of the province. So far we have gotten off lucky, the temperature has stayed in the -4 or -5 C range and the winds haven't been 'epic', although I see Cathedral Point winds peaked out at 98 kmh last evening. A friend of mine reminded me today that in the Bella Coola Valley you have to remember to look up once in a while, and a morning like this rewards you with incredible views in any direction as illustrated by today's photo. Well the east wind is here, but not the real 'Arctic' portion of it -- yet. It's never pleasant when it settles in, but with all the available weather forecasting at least they are rarely a surprise anymore and the forecasters are amazingly accurate on predicting their severity. They are usually predicted well in advance and the tell tale signs of the approaching cold front when the sky clears a bit, the pressure starts climbing and the temperature starts plummeting usually confirm the weather forecasters prediction. How much wind we feel depends on where you live in the Bella Coola Valley, but when it's really bad -- it's bad everywhere except as you get further up valley into Tweedmsuir Park, the temperature gradient between the warm coastal air and the cold interior arctic air has shifted closer to the interior air temperature and the winds are not as bad. The really bad places are down in Burke Channel - watch the Environment Canada Cathedral Point weather station, it's usually pretty interesting, winds gusting to over a 100 kmh (already gusting to 80 kmh tonight) are not uncommon. In the valley the worst places seem to be near the townsite of Bella Coola, around the Snootli stretch and up past Nusatsum, all places where the valley narrows. The Weather Doctor has an excellent description of the conditions leading to the formation of arctic outflows and how they behave, a good read (click on Weather Phenomena and Elements) Note: The Weather Doctor website is by a retired meteorologist living in Valemount BC and he has a lot of great weather information. No big arctic outflow as of this evening but it's starting to gust late tonight and the weather people are talking about it developing with some really cold temperatures in the next few days. Throughout the day it was only 5-10 km from the east in a few locations and not for the entire day. Was generally a pleasant day, reached +2 C and tonight is down to -2 C. It's presently gusting to 50 kmh ENE down at Cathedral Point (Burke Channel, east side, just north of Kwatna Inlet), a real bell weather spot for watching outflows and a place you want to be far away from in an east wind. That level of gusting at Cathedral Point is a good indication of the special weather in store for us. A good day, because it was nice and cool (-4 or-5 C) in the morning, with high light clouds and almost no wind all day. The clouds gradually closed in till around 4 PM when we got a light snowfall of less than an inch, at least in the more tropical end of the valley. It's clearing off though tonight and supposed to go much colder. Hard to believe, but it was apparent early this morning that it was going to be a nice day. After my post yesterday, it warmed up a degree in the lower valley and turned to rain which it did till sometime through the night, but not heavy rain. By dawn it was already freezing and the rest of the day just turned out like the picture above! This day of November 26, 1985 in regards to the Bella Coola Airport Environment Canada weather station records represents the recorded extreme low temperature in Bella Coola for the period of records (since 1983). If July 29, 2009 was the all time undisputed maximum temperature of 40.4 C then November 26, 1985 was the coldest recorded temperature. This day was the peak of an arctic outflow event that saw the minimum temperature in Bella Coola hit -24.4 C at 8 AM. It began on the night of November 16th when the temperature started dropping below zero at the Bella Coola Airport. The arctic outflow eventually ended on December 4 when the temperatures finally climbed above 0 C and the east wind subsided. While any readers who are continental dwellers would scoff at temperatures like this, keep in mind this is the damp coast and we had sustained arctic outflow winds of 40 km/h through out this event and many gusts well in excess. Cold arctic air from this system prevailed over all of western Canada as well, and you will often see it referred to in the weather news as the November 1985 cold spell that set many records on the BC Coast and elsewhere. When I got an early start this morning on Highway 20, there was fine light snow on and off, most of the way to Anahim Lake. My partner says it snowed big wet snowflakes for the morning in Bella Coola, then rained and some blue sky showed for a bit. Thanks for the photo. The temperature remains very stable at just above zero in the morning, climbing to 3 or 4 C as a maximum for the day. There was some very light snow for a short while in the morning, then it turned to light rain and then it was just grey, with a slight glimmer of some clear sky above the valley clouds. The trees shed most of the their snow on the mountains up to about the 1500' level, which seems where the freezing level must be holding at. Any November day that isn’t raining, blowing or snowing is a good day in the Bella Coola Valley – and that describes today. The morning was just above freezing and there was a very light snowfall for a short time period in some areas. Most of the rest of the day was pleasant with no major ‘events’. The sky was dark and grey at the end of the day and the temperature back to just above freezing. Might have hit 2o or 3o C at the most today. This is the time of the year when the bald eagles really enjoy a good spawning salmon. The valley floor is covered in snow, the days wet and cool and catching a fresh fish or even scavenging a dead one is real treat. The fish in this photo met his match when the eagles plucked it off the spawning grounds and what you see is all that’s left. There weren’t any critter tracks in the snow, except for bird foot prints, so I’m pretty sure they were successful in actually catching this one themselves and dragging it up on the snow. Can’t tell if the fish had a chance to spawn before they caught it, because there wasn't much left. With the snowpack on the valley bottom, picking off the odd spawning salmon and scavenging here and there will be all there is to look forward to for valley bald eagles for awhile. No other way to describe today than just plain grey. Near freezing in the morning and back to the same tonight, a couple little snow and rain showers along the way. Mid day was the best and it looked pretty nice to the east. The snow had a bit of crust on it today from freezing overnight. Another real November day. Started out in the morning just above freezing again and is still there tonight. Most of the day was either big wet snowflakes or a bit of rain. The highway was slushy in the morning and then cleared a little by the afternoon. This evening it has cooled down a little bit and there was a brief light snow. Not much of the snow that we got on Sunday has melted, it just settled a little. Bella Coola at the town site only has a bit of snow. First day in three that the plane wasn`t canceled to both Bella Coola and Anahim Lake so hopefully anybody waiting to come and go since Sunday made it in or out via the bus route to Anahim Lake. If I had to pick a month to miss in Bella Coola November would be the only month! Well the snow that started yesterday kept up till the wee hours this morning. Most areas of the valley received at least 5-15 cm, a lot more as you go east in the valley, more like 30 cm. In some areas the snow was a lot heavier and wetter than other areas, but generally pretty heavy snow . Highway 20 on “The Hill” is reported to have received a serious amount of snow that kept the highway ploughing contractors busy. The power went out in most of the valley in the middle of the night when one of the large trees at the rock cut near the Village of Bella Coola came down across the power line and the highway. There were also a number of smaller trees heavily laden with wet snow which fell partially on the highway. Further up valley the power is still out in the Stuie area tonight. The public schools were closed today, because the buses could not get between schools till mid morning when the tree was cleared and the power and heat restored in the schools. The good news is that the big rains stayed further south and missed us. Virtually all the precipitation in the Bella Coola Valley came down as snow. The temperature in the morning was close to 0o C and it more or less stayed there into this evening. Well the flood warnings for the southern part of the coast aren’t being applied to the Central Coast, but I think they forget to let us know about a snowfall! The morning started out at freezing with steady rain and by 9 AM had turned to snow and it didn’t stop all day. Likely have 10-15 cm already in some areas. Was planning on going cross country skiing at the East Branch XC trails, but road conditions on the hill weren’t looking good and my friend Tweeds over at Tweedsmuir Ski didn’t go up either due to the likelihood of a bunch of new snow and it takes a lot of work to get the trails all groomed again and that’s always more fun to do after the storm has passed. A good day for inside chores. A perfectly fine Bella Coola Coastal day. 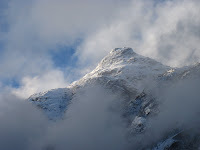 We had a brief period through the night that brought heavy rain and a bunch more snow in the mountains. The snowpack is looking really good in the Coast Mountains, but it’s also early enough that a ‘good’ snow pack can be really scary. The Global News weather is talking about the dreaded ‘pineapple’ express next week, so keep an eye on that and hope it goes well south of us if it comes, but right now things are looking really fine and late fall like. A nice day, with temperatures just below freezing in the morning. Mostly a high (7000') cloud toward the west and some blue sky showing towards the east end of the valley. It clouded over completely late in the afternoon and around dinnertime some light fine snow started but didn't amount to much. The Bella Coola River is getting clearer and down to a nice level. Hearing about a number of spots with Coho spawning in small creeks and so it is good we had such a large coho run, survivals might be okay in spite of the flood. Would a trip through the Chilcotin to or from Williams Lake in the spring, summer or fall be really complete without cows on Highway 20? I don’t think it would be. It must be one of the last highways in BC that are shared with cows, and where it is accepted as so normal, that when you make a trip in the range season and don’t see cows on the road it seems odd. Sure they can be a risk at night, but it seems like it’s just something to watch for and they really represent what the Chilcotin and the Central Coast still provide – a place where things are different. An early winter, the first serious snow on the valley bottom arrived starting late on Friday afternoon and kept up through the night. There were several wet inches by the morning. November snow in the valley is not very nice, always wet sometimes it stays sometimes it goes. In case you doubted the near home effects of the El Nino, have a read of this article from the North Island Gazette. If Humbolt Squid are in Port Hardy, I'm a believer we are having an El Nino year. As to what it means for the Central Coast and Bella Coola for the winter, I am not as sure. I've been trying to research some of the past events to determine if we would likely experience wetter, drier, warmer or colder winter, but haven't found a pattern yet. If today and this week are the trend then let's go with wet. Today was a dark, dreary November day. Rain all day long, at times heavy, but the freezing level very low most of the day until around 5 PM when the freezing level hit the valley bottom and it turned to wet heavy snow, which it has been doing for the early evening. Last comment on floods this year (hopefully). Nov 3-4, 1950 180.3 mm - Flood isolated Hagensborg, plans for new bridge to Salloompt had to be altered. Oct 16-21, 1965 183.1mm - Seven bridges and a section of road washed out. Jan 23, 1965 - Rain on recent fresh snow and freezing level up to 10,000 feet. Two bridges washed out, Hagensborg flooded, telephone exchange knocked out. A Sikorsky helicopter was on standby to evacuate. Jan 21-23 1968 157.5 mm - A total of 186cm of snow had fallen to date, likely snow on the ground of 50-80 cm in the valley, freezing level rose to 3400 metres. Bella Coola River rose 11 feet. Large flood. Sep 25-26, 1973 103.1 mm. - Major change in the Big Bend of the river. Upstream of Tatsquan was cut off. The old channel which had persisted for over a century was filled with sediment. Oct 29 – Nov 1 1978 101.2 mm. - Rip rap at airport eroded, Wilderness Air float plane terminal in the river was damaged and dock area infilled with gravel, Burnt Bridge Creek overflowed along the highway, damage in Salloompt, damage in Thorsen Creek. Dec 7-15, 1980 340.4 mm (7 days) - Airport flooded, highway closed, Nusatsum River flooded the dyke. Nov 7,8, 2004 159.5 mm – Many forestry roads washed out. Source: Rainstorm and Flood Damage Northwest British Columbia 1891-1991 and personal records. After a nice clear day yesterday,the morning broke with a very high cloud and little bit of light outflow. Late in the afternoon it started to rain, apparently another system coming, but not of the intensity of the last one. Bella Coola River is down nearly two metres from it`s highest point in the lower valley and starting to return to a more normal green rather than brown. The bed-load movement and gravel deposits must have been hard on recent salmon spawning in the the lower valley tributaries, but saw a coho spawning in one tributary today so not all is lost. X-country skiers started skiing on the old road trail at East Branch today, about a foot of good snow. The numbers are in and it's true, between Oct 28 - Nov 1 at the Bella Coola Airport they recorded 186 mm or approximately 7" of rain! Put this on top of freezing levels that went up very high with a recent snow pack and a flood is the result. Data is recovered from Environment Canada for the Airport. It was a beautiful day in the valley, by mid day the residual low cloud cleared and blue sky and cool afternoon prevailed. Walking about and looking at places only a few days ago were either raging torrents or under a lot of water, today it seems calm and fresh. Describing to someone what the weather was like a few days ago who wasn't here loses something in the translation if you weren't there to experience and enjoy 186 mm of rain. Had to make a quick trip to Williams Lake today. It was snowing in Heckman Pass. Looks like about a 15-20 cm snowpack and looking very wintery. Noticed they replaced the 'local' unofficial sign with a proper sign marking the high point of the pass which looks very nice. Another damp day in Bella Coola. The October foliage colours in the Bella Coola Valley were much better than most years this fall. It must be the result of the very dry hot summer and relatively nice fall with a few cool days in early October. Most years the Cottonwoods often drop their leaves while still green or only partially coloured, but this year it seems the extensive stands of valley bottom Cottonwood took on a very nice yellow while the birch in most cases was brilliant yellow. The only thing missing were the reds that are characteristic of the vast eastern mixed hardwood stands, but all in all a nice bonus to the end of the summer. The rain of the last few days pretty much ended the fall colour display. 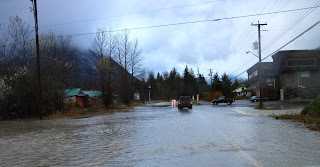 It wasn’t the biggest flood Bella Coola Valley has seen, but certainly some problems have been created and some areas had higher water than others. It rained most of the night, but luckily the freezing level came down to about 3000’ through the night and so at higher altitudes there was snow. The Thorsen Creek bridge was saved, luckily the road contractor had an excavator move in and dealt with some logs that had become jammed and could have easily damaged the bridge. Hagensborg is flooded from the Bay Hotel to the Legion, Saloomt Road was flooded in the normal low spot, Hammer road is washed out in two places, the forestry bridge on Noosgulch washed out the approach on one side and Nusatsum forestry road is washed out at 2 km. There was fresh snow on The Hill (Highway 20) today as well. The rain was much slower most of the day and hopefully this storm has ended and now we can wait for the first big snow. So today we are having a 'Bella Coola Rain' event. It started yesterday, there were clear and ominous warnings from the weatherman on Wednesday which had the calm before the storm feeling most of the day. It has been raining more or less continuously since Thursday morning. It's always got potential for trouble because we have had some snow accumulation in the mountains and it's early light non snow pack snow, which combined with the tail end of a tropical rainstorm where freezing levels rise to 2-3000 metres, is a potential recipe for trouble. By 3 PM today, water levels were beyond seasonal freshet and at flood stage in some areas. The water was very close to coming over the highway at the Thorsen Creek Bridge, there was the usual stretch of highway at Meechams garage under 2-6" of water and side creeks were pretty wild. Hammer Road was cut in two places early in the day. I'll provide a better overview of the whole extent of the event when it is over. In my checking around today I was reminded about the beautiful 'smells' of a flood. There are two distinct smells, one is the fresh earth smell, of all the siltation that is being carried down from the various places where erosion is happening and soil being deposited, the other is the distinct mushroom/fungus smell of all the fall musty leaves and organic material being washed down. It's a beautiful smell and you'll all know what I'm describing if you have smelt it. Still raining, Friday evening and still more snow to come down. Hope it's not the big one, doesn't feel like it, but there will be some damage.